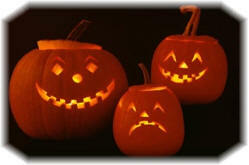 Halloween is celebrated on October 31st in Canada. Halloween is a favorite family celebration – a time for traditions such as dressing in costumes, trick-or-treating around the neighborhood, and carving pumpkins. Children dress up in funny or scary costumes and go "trick or treating", and neighbors are expected to respond by giving them small treats. Adults may also dress in costume for Halloween parties. Halloween (the evening before All Saints or All Hallows Day) is a secular celebration based on ancient Druid customs dating back to 700 B.C. The Druids, a Celtic religious order in ancient Britain, Ireland and France, believed that the souls of the dead returned to mingle with the living on "hallowed eve," October 31. Each year on that night, the Druids would build bonfires and offer sacrifices of crops and animals, and individuals would dress in costumes to disguise themselves from these spirits.